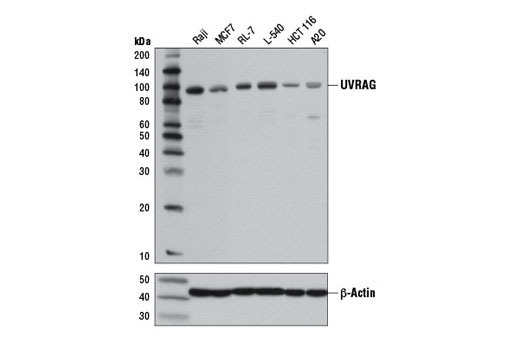 Western blot analysis of extracts from various cell lines using UVRAG (D2Q1Z) Rabbit mAb #13115 (upper) or β-Actin (D6A8) Rabbit mAb #8457 (lower). HCT 116 cells have been reported to contain a monoallelic frameshift mutation resulting in significantly reduced levels of endogenous UVRAG expression (11). Western blot analysis of extracts of various cell lines using Atg9A (D4O9D) Rabbit mAb #13509. Western blot analysis of extracts from various cell lines using PIK3R4 Antibody #14580. 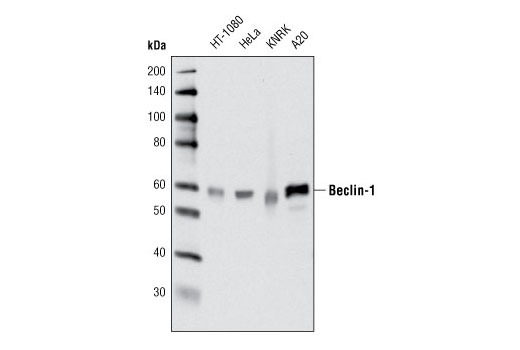 Western blot analysis of extracts from various cell lines using Beclin-1 (D40C5) Rabbit mAb #3495. 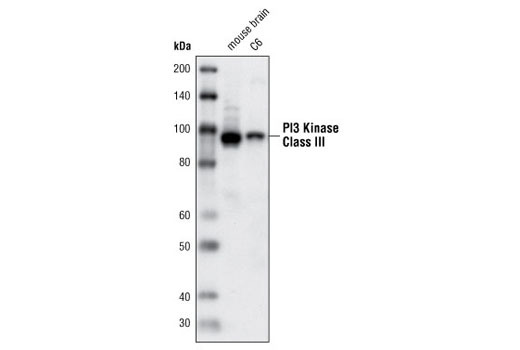 Western blot analysis of extracts from mouse brain and C6 cells using PI3 Kinase Class III (D9A5) Rabbit mAb #4263. Western blot analysis of extracts from various cell lines using Bif-1 Antibody #4467. 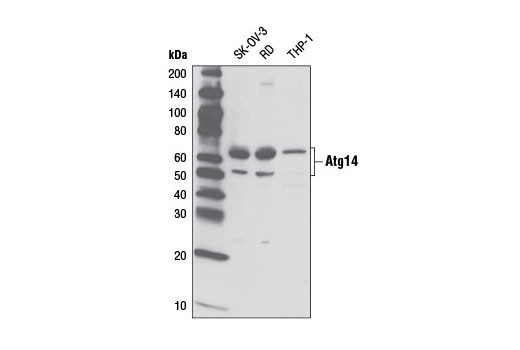 Western blot analysis of extract from various cell lines using Atg14 Antibody #5504. Western blot analysis of extracts from various cell lines using Rubicon (D9F7) Rabbit mAb #8465. Western blot analysis of extracts from mouse brain and C6 cells using PI3 Kinase Class III (D9A5) Rabbit mAb. 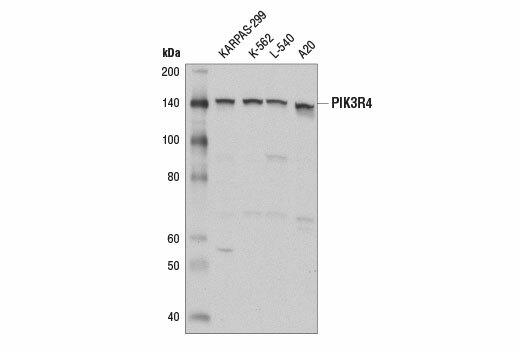 Western blot analysis of extracts from various cell lines using PIK3R4 Antibody. Western blot analysis of extracts from HeLa cells, transfected with 100 nM SignalSilence® Control siRNA (Unconjugated) #6568 (-), SignalSilence® Atg14 siRNA I #6286 (+) or SignalSilence® Atg14 siRNA II #6287 (+), using Atg14 Antibody #5504 (upper) or β-Tubulin (9F3) Rabbit mAb #2128 (lower). 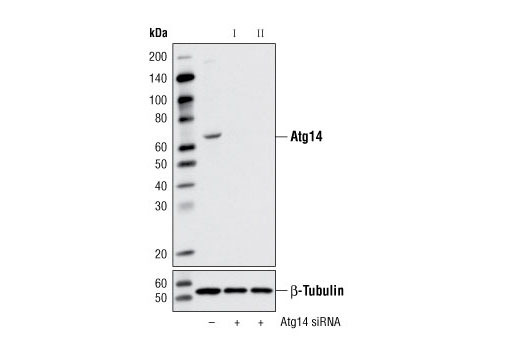 The Atg14 Antibody confirms silencing of Atg14 expression, while the β-Tubulin (9F3) Rabbit mAb is used as a loading control. Western blot analysis of extracts from various cell lines using UVRAG (D2Q1Z) Rabbit mAb (upper) or β-Actin (D6A8) Rabbit mAb #8457 (lower). HCT 116 cells have been reported to contain a monoallelic frameshift mutation resulting in significantly reduced levels of endogenous UVRAG expression (11). 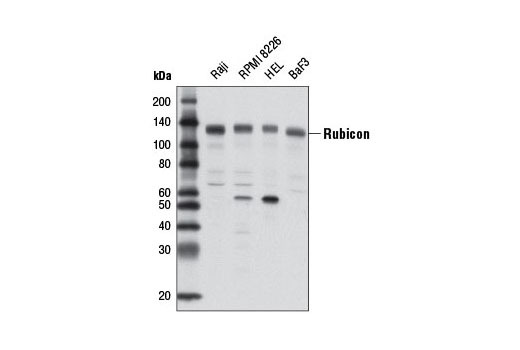 Western blot analysis of extracts from various cell lines using Rubicon (D9F7) Rabbit mAb. Western blot analysis of extracts from various cell lines using Bif-1 Antibody. 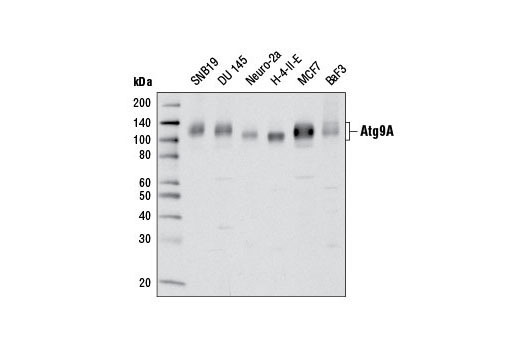 Western blot analysis of extracts of various cell lines using Atg9A (D4O9D) Rabbit mAb. 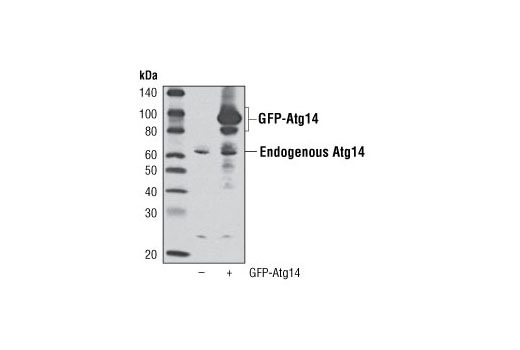 Western blot analysis of extract from various cell lines using Atg14 Antibody. 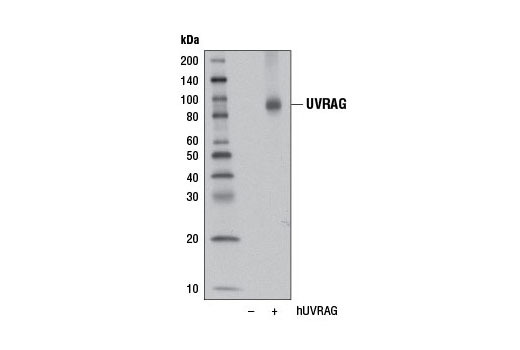 Western blot analysis of extracts from 293T cells, mock transfected (-) or transfected with a construct expressing human UVRAG (hUVRAG; +), using UVRAG (D2Q1Z) Rabbit mAb. 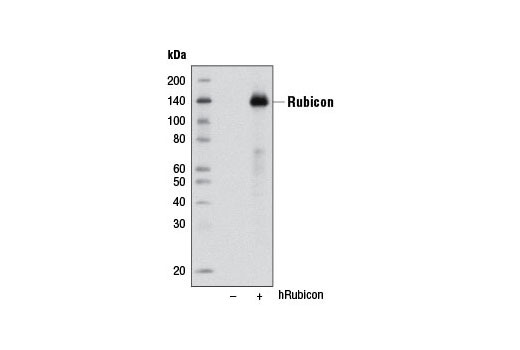 Western blot analysis of extracts from 293T cells, mock transfected (-) or transfected with human Rubicon (hRubicon, +), using Rubicon (D9F7) Rabbit mAb. Rubicon construct was kindly provided by Dr. Qing Zhong, University of California, Berkeley, CA. 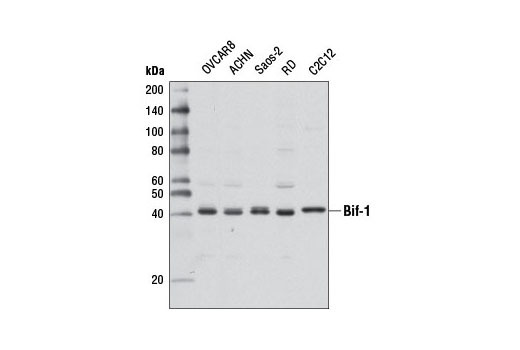 Western blot analysis of extracts from RD cells, transfected with 100 nM SignalSilence® Control siRNA (Unconjugated) #6568 (-) or SignalSilence® Atg9A siRNA I #7051 (+), using Atg9A (D4O9D) Rabbit mAb (upper) or β-Actin (D6A8) Rabbit mAb #8457 (lower). 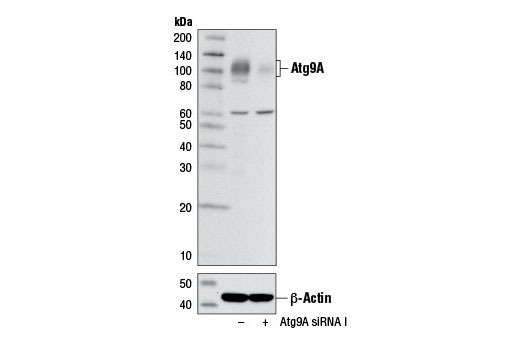 The Atg9A (D4O9D) Rabbit mAb confirms silencing of Atg9A expression while the β-Actin (D6A8) Rabbit mAb is used as a loading control. Western blot analysis of extracts from 293T cells, mock transfected (-) or transfected with a GFP-Atg14 construct (+), using Atg14 Antibody. GFP-Atg14 construct was kindly provided by Dr. Qing Zhong, University of California, Berkeley CA. Immunoprecipitation of UVRAG from PANC-1 cell extracts using Rabbit (DA1E) mAb IgG XP® Isotype Control #3900 (lane 2) or UVRAG (D2Q1Z) Rabbit mAb (lane 3). Lane 1 is 10% input. 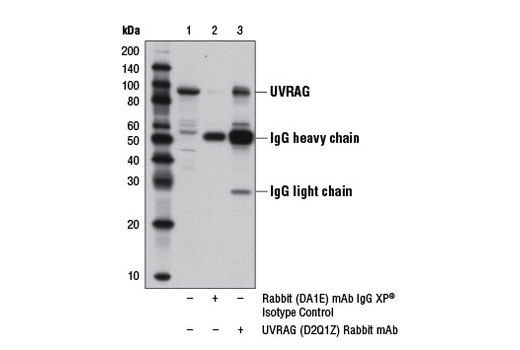 Western blot analysis was performed using UVRAG (D2Q1Z) Rabbit mAb. Immunoprecipitation of Atg9A from Hep G2 cell extracts using Rabbit (DA1E) mAb IgG XP® Isotype control #3900 (lane 2) or Atg9A (D4O9D) Rabbit mAb (lane 3). Lane 1 is 10% input. 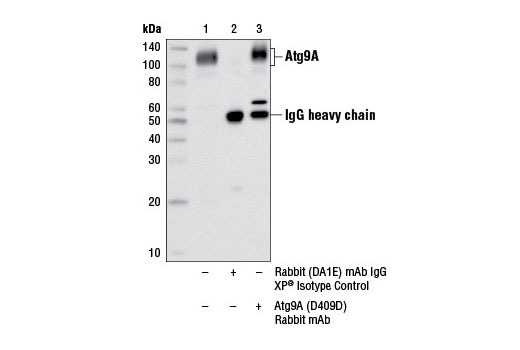 Western blot analysis was performed using Atg9A (D4O9D) Rabbit mAb. The Autophagy Vesicle Nucleation Antibody Sampler Kit provides an economical means of detecting target proteins involved in autophagosome formation and maturation. 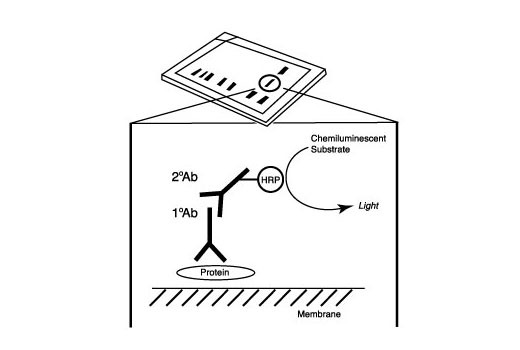 The kit contains enough antibody to perform two western blot experiments per primary antibody. Each antibody in the Autophagy Vesicle Nucleation Antibody Sampler Kit detects endogenous levels of its respective target. Rubicon (D9F7) Rabbit mAb detects a band of unknown origin at 55 kDa. Monoclonal antibodies are produced by immunizing animals with a synthetic peptide corresponding to residues surrounding Lys630 of human PI3 kinase class III protein, residues surrounding Thr72 of human Beclin-1 protein, residues surrounding Gly502 of human UVRAG protein, residues surrounding Leu210 of human Rubicon protein, or residues surrounding Gly780 of human Atg9A protein. Polyclonal antibodies are produced by immunizing animals with a synthetic peptide corresponding to residues surrounding Gly825 of human PIK3R4 protein, residues surrounding Val215 of human Atg14 protein, or residues surrounding Gly129 of human Bif-1 protein. Polyclonal antibodies are purified by protein A and peptide affinity chromatography. Autophagy is a catabolic process for the autophagosomic-lysosomal degradation of bulk cytoplasmic contents (1,2). Autophagy is generally activated by conditions of nutrient deprivation but is also associated with a number of physiological processes including development, differentiation, neurodegeneration, infection and cancer (3). The molecular machinery of autophagy was largely discovered in yeast and is directed by a number of autophagy-related (Atg) genes. These proteins are involved in the formation of autophagosomes, cytoplasmic vacuoles that are delivered to lysosomes for degradation. The PIK3R4/PI3K class III complex interacts with Beclin-1 to play a role during several stages of autophagy. Autophagosome formation is stimulated when Atg14 complexes with PIK3R4, PI3K class III, and Beclin-1. 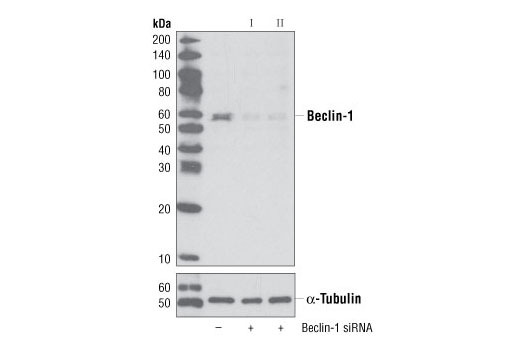 The UVRAG protein competes with Atg14 for Beclin-1 binding, forming a mutually exclusive complex with PIK3R4, PI3K class III, and Beclin-1 that regulates autophagosome maturation. Autophagosome maturation is impaired in the presence of the Beclin-1-binding protein Rubicon (4,5). Co-expression of PIK3R4 is required for PI3K class III activation and regulation by both Beclin-1/UVRAG and nutrient levels (6). Bif-1 directly binds to UVRAG, forming a complex with Beclin-1, resulting in increased PI3-kinase class III/Vps34 activity required for autophagosome maturation (7). Inhibition of GSK-3β, as seen during nutrient deprivation, results in increased expression of Bif-1, and can contribute to autophagic cell death (8). Atg9A is an integral membrane protein that is required for both the initiation and the expansion of the autophagosome (9,10). Recruitment of Atg9A to the autophagosomal membrane is dynamic and transient as Atg9A also cycles between autophagy-related structures known as omegasomes, the trans-Golgi network (TGN), and endosomes, and at no point becomes a stable component of the autophagosomal membrane (9,11). The precise regulation of Atg9A trafficking is not fully clarified, yet it is suggested to involve p38 mitogen-activated protein kinase (MAPK)-binding protein p38IP and the Beclin-1-binding protein Bif-1 (12,13). Yang, J. et al. (2010) J Cell Sci 123, 861-70. Yamada, T. et al. (2005) J Biol Chem 280, 18283-90. Orsi, A. et al. (2012) Mol Biol Cell 23, 1860-73. Yan, Y. et al. (2009) Biochem J 417, 747-55. Webber, J.L. and Tooze, S.A. (2010) EMBO J 29, 27-40. Takahashi, Y. et al. (2007) Nat Cell Biol 9, 1142-51. Takahashi, Y. et al. (2011) Autophagy 7, 61-73.